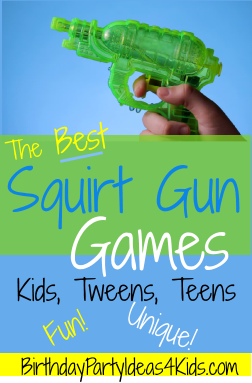 The Best Squirt Gun Games for kids, tweens and teens! Our favorite Water Gun games that are easy to play, cheap, unique and perfect for summer parties, picnics, parks and backyard get togethers - anytime you need to cool down with some summer fun! All the games require squirt guns and a large container filled with water that can be used as a fill up station during the games. A large tote or small kiddie pool works great and will allow lots of kids to fill up their water guns at the same time. Anything else required to play the games will be listed right below the game title in italics. Hang beach balls from tree branches by tying string around the beach ball valve. Write different point values on the beach balls (5, 7, 10, 12, 15 points) where the higher point value is harder to hit. Line players up and have them try to hit as many targets as they can with the water gun filled up only once. When the beach ball moves you will know it's been hit. Great deals on Squirt Guns! Fill the pool with water and tape a piece of string across the top of the pool about 1/4 of the way from each players side high enough so that the boat can float underneath them. Place the boat in the center of the pool. Players use their squirt guns to move the boat back and forth trying to get it to pass under their opponents goal line (string). When the boat is moved completely behind the string the player earns 1 point and the boat is placed back in the center of the pool. Play to 15 points. Variation: Play individually or with 2 - 3 players on a team. The bigger the pool the more challenging the game. Tip: If you don't have a boat a ping pong ball or any ball that floats will work! Shaving cream and 2 large beach balls. Cover the beach balls with shaving cream. Set the beach balls on top of a large plastic cup so they don't move. Divide the kids into two teams and give each player a water gun. Teams try to clean off the shaving cream from their beach ball using the water from their squirt guns. The first team with a clean ball wins! Give individuals (or teams) 25 - 40 plastic cups each and tell them to build a fortress with them. When the fortresses are done have the opposing team (or players) try to knock down the fortress using only a squirt gun. There is a little bit of a learning curve to figure out how to use the cups to build the best fortress so play several rounds. Lots of fun! Played just like the game of tag. One player starts out with a squirt gun and they tag others players by squirting them with water. If a player is tagged they must freeze in place. Other players can unfreeze frozen players by crawling through their legs. But be careful! If the player gets tagged while trying to unfreeze another player then both players are frozen! When all players have been frozen the player with the water gun chooses a new player to use the squirt gun and all players are unfrozen for a new round of play! The night before the game wet down a t-shirt and fold then place in the Ziploc bag. Fill the bag with water and seal. Lay flat and freeze overnight. Right before the game remove the frozen t-shirt and ice from the bags and give one to each player (or team). Players can use only their squirt guns to melt the ice around the t-shirt. First player (or team) to melt the ice enough so that the player can put on the shirt wins! Lots of fun and a great way to cool off on hot summer days! The night before the game fill several (one per player or per team) half way with water. Add the plastic toys to the pan and fill the pan with cold water. Freeze over night. The toys should be in the center of the ice the next morning. Pop the ice out of the pan in one piece and set on the grass (or game area). Give each team or player a squirt gun and have them squirt water at the ice block until all the toys are free from ice. Players can only use water from the squirt gun to melt the ice - no hands. First team (or player if playing individually) to free all their items from the ice wins! Remove the label from 16 ounce water bottles and replace with colorful duct tape or paper. Fill with rocks or dirt 1/3 of the way full to weight down the bottles so they won't move. Place ping pong balls on the openings of the water bottles (make sure to remove the water bottle caps!) and set up targets in a row. Mark off a shooting line with tape or sidewalk chalk for the players to stand behind while they try and shoot the ping pong balls off the bottles with their squirt guns. Variation: Set up bottles in rows or a pyramid. Increase the distance between the shooting line and the targets for each round of play. Set the plastic cups upside down to form a pyramid (3 cups on the bottom, 2 on the next level and 1 on the top) on a table. Players take turns trying to knock down the pyramid with water from their squirt guns. Take turns or set up several pyramids and see who can knock theirs over first. Variation: Set up larger pyramids using 10 cups, 15 cups or 21 cups. Teams try to get the beach ball from the center of the playing field into the opposing teams goal using only the water from their squirt guns. 1 Point for each goal scored. Play to 10, 15 or 21 points. No hands or feet can touch the ball or the other team gets the ball at the sideline. Lots of fun and a real team sport! Set up the game by punching 1 hole in each bottom of the cups about 1/2 inch from the side. Tie the string onto a tree and then thread the end of the string through the hole in the bottom of the cup. Tie the other end of the string a distance away about 4 - 5 feet from the ground. Make a separate string and cup so that teams can play or more tracks for individual games. The players fill up their water guns and shoot at the inside of the plastic cup to make it move down the string. First player to get their cup to the other end wins! Set up the game the same as the above String Race game only instead of threading one cup on the string thread two cups onto the string. One cup facing one way and the other cup facing the other way. Mark the middle of the string with a permanent marker. 4 feet on each side of the strings middle mark place a mark. This mark is each sides goal line. At the same time players try to shoot water into the cup facing them to move both cups down the string to their opponents goal line. Each time one player moves both cups down the string past their opponents goal line they win 1 point. Then reset the cups to the middle mark and play to 10 or 15. Lot's of fun and sure to get everyone wet! Each team gets a high powered water gun and a beach ball. Teams line up one after the other at one side of the playing field. At the other side of the field set up 2 orange cones (or anything that can be used as a turnaround point). One at a time team members move a beach ball from the starting line, across the field, around the turn around point and back to their team. They them hand off the water gun to the next player in line. The first team with all their players to complete the course wins! Variation: Set up a few obstacles to make the game harder such as hula hoops on the ground, chairs that players have to navigate the ball through and or small ramps. Tape large paper canvas' onto a fence about 2 feet off the ground. Fill squirt guns with different colors of acrylic paint and let kids use the water guns to paint their canvas. Variation: Tape white t-shirts onto the fence instead of canvas and let the players create their own t-shirt art using fabric paint. Ping pong balls (2), plastic jug or container with an opening large enough that the ping pong ball can be placed inside easily. Set up the containers with a ping pong ball at the bottom of each one at one end of the playing field. Teams line up at the other end of the playing field and one at a time fill up the water gun, run to their container and squirt the water into their container. Then they run back to their team and the next player repeats the steps until one team can make the ping pong ball in their container float to the top and fall to the ground. Fast paced fun!